I realised I’ll most likely never have Daborah Lippmann’s beautyful glitter polishes like Candy Shop, Happy Birthday, Forget You etc. They are expensive and not very easy to get (at least for me). 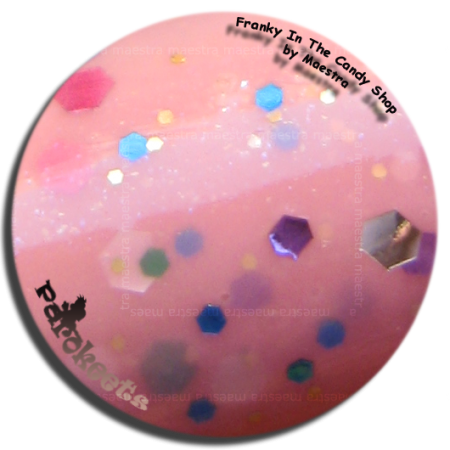 So I tried to create my own Candy Shop polish. I named it Franky In The Candy Shop. Here it is. Three coats and a top coat. It’s not near the real deal, but I still like it. Maybe I like it even better, because the glitter is not as dense as in the real Candy Shop polish. What do you think about my fankenpolish? This is amazing!! Gorgeous!! My frankening skills are not good yet but I’ll definitely try to make something similar! It’s very easy. I’m pretty sure you can do it!!! Tale Circus Confetti je res posrečen, pa še zelo dostopen in poceni.